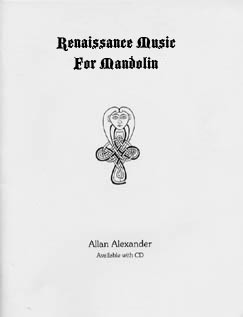 This book provides the mandolin player with a unique opportunity to play a wide variety of Renaissance music including many lute pieces. From "Cobbler's Hornpipe" to the lovely "Home Again, Market Is Done", you will have a great time with these selections. It can be a great gig book, either for early music events or for any performance. The pieces are quite playable and lay well on the fingerboard. The book contains the music notation with chord symbols as well as tablature. The CD contains Allan playing both the Mandolin and the guitar with the Mandolin on the left channel and the guitar on the right.